The Investigative Project on Terrorism has released a new film exposing the activities of the Muslim Brotherhood inside the United States and how its front groups and sympathizers intimidate the major media and Hollywood. The Muslim Brotherhood, now in charge of the Egyptian government and making major advances throughout the Middle East, was established in 1928 and is considered by experts to be the parent organization of terrorist groups such as al-Qaeda and Hamas. Coming just days before the November 6 presidential election, the film, titled “Jihad in America: The Grand Deception,” highlights a problem of subversion in the U.S. that both major political party candidates, Barack Obama and Mitt Romney, have not been asked by the media to address. Investigative Project on Terrorism executive director Steven Emerson, himself the target of death threats because of his work over the course of decades exposing Islamic extremist networks, spoke at a panel discussion in Washington, D.C. on Thursday October 25th that was attended by Accuracy in Media. We also reviewed an advance copy of the film. Several years in the making, the film describes how Muslim Brotherhood fronts, such as the Council on American-Islamic Relations (CAIR), have pursued a strategy described in secret documents as the “Civilization-Jihadist Process” of destroying Western civilization from within and making America into an Islamic state. In addition to secret wiretaps and videos of Muslim Brotherhood activities, the film includes newly declassified documents and interviews with law enforcement officials, prosecutors, and journalists. Although the film suggests the Muslim Brotherhood front groups are operating as illegal agents of a foreign power, there is more at stake than just subversion. The film contends that the Muslim Brotherhood is directly involved in radicalizing American Muslims who then carry out terrorist missions. The film looks at the case of al-Qaeda leader Anwar al-Aulaqi, who was in contact with Nidal Malik Hasan and later killed in a U.S. drone strike, and highlights the pro-terrorist views of Yusuf al-Qaradawi, the spiritual leader of the Muslim Brotherhood who has perhaps become best known for his program on Al-Jazeera. Al-Jazeera English is seeking carriage on U.S. cable and satellite systems in the U.S. while its political patron and funder, Qatari Emir Sheikh Hamad bin Khalifa Al-Thani, just gave a major gift of $250 million to Hamas. Despite the advances of the Muslim Brotherhood here and abroad, there has been a failure by political leaders to even acknowledge the nature of the problem. The film shows Obama Administration Attorney General Eric Holder during a congressional hearing, refusing to even use the term “radical Islam” in describing terrorism by Muslim militants. But the Bush and Clinton Administrations are also criticized in the film for ignoring the threat and entertaining Muslim Brotherhood operatives at the highest levels of government. However, the October 25th panel discussion featured Abdur-Rahman Muhammad, an outspoken Muslim who broke with the Muslim Brotherhood agenda and now writes a blog, “A Singular Voice.” He participated in meetings with top Muslim Brotherhood leaders in the U.S.
Muhammad said Muslim leaders here and abroad have studied and copied communist methods of infiltrating and penetrating America and other Western nations. “They have studied the tactics of the far left,” he said. Emerson, executive producer of the film, commented that it is ironic that Rachel Maddow of MSNBC has regularly featured CAIR representatives on her show when she would never be invited to speak to a CAIR conference because of her own open lesbianism. 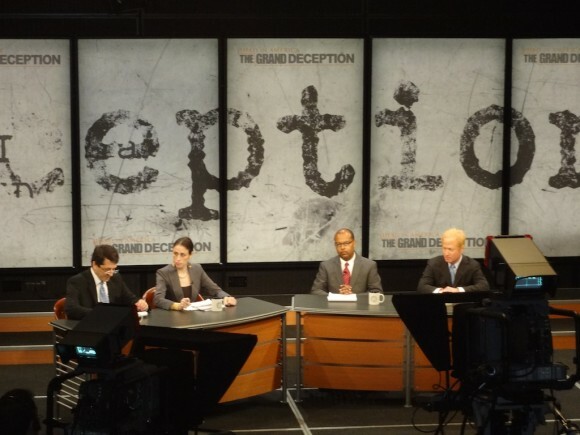 Other speakers were Rachel Milton, producer of “The Grand Deception;” Daniel Pipes, President of the Middle East Forum; and Michael Fechter, Editor-in-Chief of the Investigative Project’s website. The film says CAIR’s terrorist connections have been whitewashed by such news organizations as the taxpayer-subsidized Public Broadcasting Service (PBS), and cites evidence that Hollywood films are now screened and edited to eliminate negative depictions of Arabs and Muslims. For example, in the 2002 film, “The Sum of All Fears,” the villains were changed from Muslims to neo-Nazis. Publishing giant Random House killed a book in 2008 about the Islam Prophet Muhammad’s relationship with his child bride. Yale University Press published a book about Danish cartoons said to be offensive to Islam without publishing the cartoons themselves. An episode of Comedy Central’s animated cartoon series “South Park” was deleted from the Internet because of threats over its depiction of Muhammad. The FBI officially cut its ties to CAIR in 2009, after the organization was listed as an unindicted co-conspirator and a Hamas front in the Holy Land Foundation terrorist financing court case. CAIR has advised Muslims in America not to cooperate with the FBI. Abdul Rahman Al-Amoudi, now serving a 23-year prison term for supporting terrorism and terrorist groups, is a Muslim Brotherhood representative in the U.S. whose work is examined in detail in the film. He had been put in charge of the military Muslim chaplain program by the Defense Department and was sent on taxpayer-subsidized “good will missions” by the State Department in the 1990s. Producers of the film attempted to interview Al-Amoudi in prison. He declined but sent a letter reaffirming his membership in the Muslim Brotherhood. The article does not seem to mention how one can obtain a copy of the film.